In today’s difficult job economy, a degree in hospitality and tourism management can offer several advantages over general business majors. The high rate of employability among hospitality graduates confirms that these programs develop useful skill sets and provide access to a wide range of career opportunities in a growing international field of employment. Why choose the Hospitality Industry? Career opportunities are abundant in the travel and tourism industry which accounts for approximately 8% of worldwide employment. 1 Within the field of hospitality there are many types of businesses, including hotels, restaurants, cruise ships, travel companies, tourism, luxury brands, theme parks, events, spas, and many other service organizations. Additionally, the international nature of travel and tourism allows hospitality graduates to start a career in major corporations, or to start their own business as entrepreneurs, with access to employment opportunities worldwide. 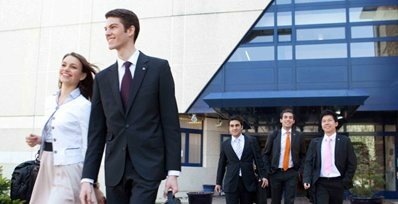 Unlike traditional degrees which focus on theoretical learning, a good hospitality program focuses on developing leadership and applicable management skills through hands-on learning and international internships. Multi-campus networks offer combined strengths for industry connections, recruitment and alumni networks to enrich career resources for students and graduates. Additionally, students have the advantage of studying at one school with many locations, making it easy to spend semesters abroad without the administrative hassle of transferring credits and enrolling to a new school. Overall, international hospitality programs offer an unbeatable combination of business education, professional experience and career resources leading to high graduation placement rates and diverse long-term career prospects.